The Large Hadron Collider has finally started operations again. The largest scientific instruments ever created, the Large Hadron Collider or LHC is a gigantic 17-mile-long circular underground tunnel where scientists collide together particles that have been accelerated to enormous speeds. So far at least 9 billion dollars have been invested into this machine, and physicists claim that it is a great success. But the Large Hadron Collider has actually produced relatively modest results which haven't clearly justified its costs. The 9 billion dollars spent on the project would have been better spent on other scientific projects. What has the LHC discovered so far? The only really big discovery was the verification of the existence of the Higgs Boson, a type of particle. But it seems this isn't an item that can justify the gigantic cost. Scientists already strongly suspected that the Higgs Boson existed before the Large Hadron Collider started operating, so the LHC didn't really discover the Higgs Boson. The LHC merely confirmed that the Higgs Boson exists, and that it has a particular mass. While the Higgs Boson and its related Higgs field are important, it is unlikely that any great bonanza will be reaped from verifying the existence and mass of the Higgs Boson. The discovery of the electron led to the incredibly useful thing called electronics, but it is hard to imagine any useful new science or technology coming from the confirmation of the existence of the Higgs Boson. Why not? Because electrons are stable and abundant in our world, once we understood them, we could conveniently put them to our use. But the Higgs Boson only stays around for less than a sextillionth of a second,. It also requires fantastic amounts of energy to produce a single Higgs Boson. Give these facts, it seems hard to imagine any practical use that can be made of the Higgs Boson. Even if something doesn't have much practical value, it might be justified to spend money on it if there is tremendous public interest. But in the case of the Higgs Boson, there is very little public interest. When scientists explain the Higgs Boson and the Higgs field that is related to it, they start getting into abstruse physics that the average person finds very hard to understand, and has very little interest in. From the standpoint of the average Joe, the Higgs Boson is a bore and a snooze. Despite hyped-up stories about possible future discoveries, it is not likely that further runs of the Large Hadron Collider will produce much in the way of either practical discoveries or discoveries that the average person has much interest in. So it is easy to imagine science projects that would have been a better use of the 9 billion dollars used by the LHC. For example, the 9 billion dollars could have been spent on practical medical research that might have saved many lives and reduced much human suffering. Another alternate use of the 9 billion dollars would have been to fully fund the search for extraterrestrial intelligence (SETI). When people talk about SETI, they are mainly talking about the construction and maintenance of large radio antennae designed to pick up radio signals transmitted by civilizations on other planets. Such projects have so far only been given funding of roughly a thousandth of the cost of the Large Hadron Collider. Making a full-scale effort at SETI would probably require several billion dollars. Such dollars have never been spent, partially because projects like the LHC are sucking up our science dollars. A project such as SETI might produce results vastly more interesting than the results of the Large Hadron Collider. The average person devotes perhaps 10 minutes a year to reading about the results from the LHC. But if SETI were to succeed, and we were to start picking up radio signals from another civilization, it might be an entirely different matter. The results could easily include photos of some other planet which might be vastly more advanced than ours, photos which can be transmitted over radio wavelengths (yes, is it possible to transmit photos by radio, given a simple coding system in which particular radio blips stand for particular pixels). The results might even include television programs that originated on another planet. Such things would be an endless source of fascination that the average person might scan for hundreds of hours each year. 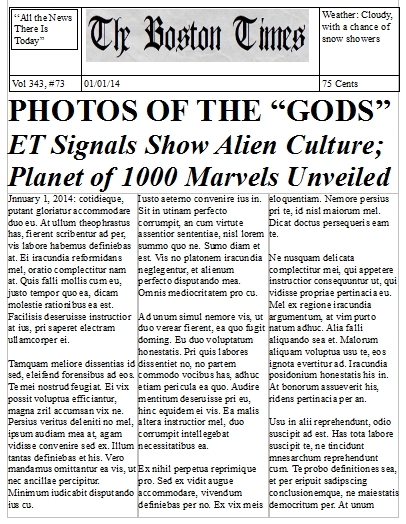 If we had fully funded SETI, we might now be seeing headlines like the imaginary headline below. We can also imagine the practical benefits that might accrue from picking up radio signals from extraterrestrials. Such benefits might be unlimited, since receiving radio signals from a civilization vastly more advanced than ours might allow us to improve our technology in thousands of different ways. 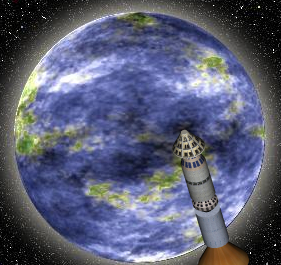 But rather than fully funding a SETI project that might produce the greatest practical results combined with results of the greatest public interest, the decision was made instead to fund the Large Hadron Collider project, which has given us very little in the way of practical results, and results which are not of much interest to the general public. Why? I can think of two reasons that may help explain it. One is the inflated authority that physicists have in our society, authority that may be excessive considering how many physicists these days are concentrating on cherished ethereal theories that haven't passed observational tests. Given such authority, people are reluctant to say no to physicists with billion-dollar wish lists. Another reason is our unreasonable tendency to shun ideas or projects that may be associated with the paranormal. Whenever large-scale funding for SETI is proposed, many will pull out their paranormal phobias, and start trying to use ridicule that includes comments about “little green men.” The same paranormal phobias that have inhibited discoveries about our own minds may be keeping us from making discoveries about minds very different from ours. Postscript: By this post I don't mean to suggest that I am "anti-LHC," but merely that I think a full-scale SETI program would have been a better use of funds. I certainly appreciate the great work scientists are doing on the Large Hadron Collider, and I am very interested in the results it has achieved. I simply think that a full-scale SETI project might have produced results of much greater interest.